The University of Manchester will hold its fifth MBA Graduation Ceremony in the region, for students of Manchester Business School (MBS) Middle East Centre, on Thursday, 16th November 2017 at The Godolphin Ballroom, Jumeirah Emirates Towers. The Presiding Officer at the graduation ceremony will be Professor Fiona Devine, Head of Alliance Manchester Business School and the ceremony will be held under the presence of His Excellency Sheikh Nahayan Mabarak Al Nahayan, UAE Minister of Culture and Knowledge Development. 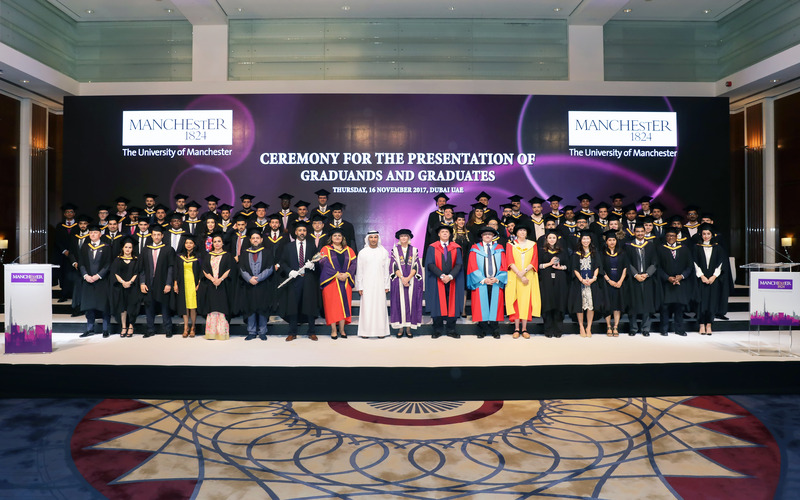 The University of Manchester graduation ceremony in the Middle East is the right occasion for all the latest UoM students in the region who have successfully completed their post-graduate degree. The University of Manchester is one of the oldest business schools in the UK and Europe’s largest campus based business school. UoM opened its Middle East Centre in Dubai Knowledge Park in 2006 and, today it is the largest and fastest growing of the School’s network of six centres around the world. The Middle East Centre supports more than 2,000 part-time MBA students in the region, many residing in the UAE, and has a community of around 7,000 alumni in the region. The School offers the part-time Manchester Global MBA programme to working professionals who meet the entry criteria. The UoM MBA progammes are triple accredited and are consistently ranked amongst the worlds top ranked programmes. Message from Randa Bessiso, Director - Middle East, The University of Manchester said: "On behalf of the team, I would like to congratulate every one of you on achieving the high standards required to earn your Manchester Global MBA. Of course, your graduation is just the beginning of the next phase of your career and our aim now is to help support you in achieving your next objectives through our careers service, executive education opportunities, networking and an active alumni group. Wherever you are in the world, the UoM international centres and global alumni network ensures you are always close to UoM and your professional peers. The quality of our students continues to be the defining feature of UoM in the Middle East and of course we enrolled nearly 200 new MBA students onto the Global MBA programme, passing the 2,000 MBA student milestone, just 10 years after opening the Middle East Centre in Dubai, in 2006. Over the last five years, the Middle East MBA graduation ceremony has become the highlight of the year, when we all share the success of students and celebrate with families and friends. Finally, on behalf of the UoM Middle East Centre, I would like to thank every one of you for choosing to study with UoM. Our school is only as good as our students and we are proud and privileged to be supporting a world class group of students and alumni." This is our fifth MBA graduation ceremony for the Middle East and I am struck each year by the quality of students we continue to attract and graduate – and students from the region are some of our best performing across the entire University of Manchester international network of centres. This year, the ceremony has an additional special dimension as we mark the renaming of the Middle East Centre in Dubai – as The University of Manchester Middle East Centre. After more than 10 successful years in the Middle East, working to transform the careers and lives of business and management leaders, we now look forward to the next decade with even greater optimism and confidence, as The University of Manchester in the Middle East. I am delighted to welcome all our graduates and guests to the fifth MBA graduation ceremony for the Middle East - and the first to be held in the region since we renamed the Dubai centre as The University of Manchester Middle East Centre. The Middle East MBA graduation ceremony is the highlight of our year when we all share the success of our students and celebrate with families and friends. We are very confident that in a rapidly changing global business environment, your new knowledge and your professional network of like-minded students and alumni, will help give you the confidence to accelerate your current career or build and develop a satisfying and sustainable new career in your chosen field. The fact that you have managed your career, time and personal life whilst successfully completing a very demanding and globally recognised MBA programme, clearly demonstrates your deep professional commitment and marks you out immediately as an exceptional, serious business executive. Wherever you choose to continue your career, our international centres and global alumni network means you are always connected to your professional peers. Once again, we are privileged to be holding today’s ceremony under the generous patronage of His Excellency Sheikh Nahayan Mabarak Al Nahayan, UAE Minister of State for Tolerance; His Excellency has played such a significant role in making this ceremony a very special occasion for us all and we are deeply grateful for his continuing support and inspirational leadership. On behalf of the regional team at The University of Manchester Middle East Centre, our congratulations on your success; it has been our privilege to support a group of very accomplished students and we wish you every success in your future careers. Of course, you will remain part of the University’s regional community, as members of the Middle East Alumni Association. We hope you all enjoy this wonderful occasion.